This paper aims to analyze the dominant literary techniques of Khlong Phab Rueng Ramakien, the verse describing of the Ramakien bas-reliefs, at Phra Chetuphon Temple. The study reveals that there are many literary techniques used in Khlong Phab Rueng Ramakien in order to describe the pictures of the bas-reliefs: presenting the details of the circumstances of the pictures concisely and systematically, characterizing the characters in the pictures to be lively by using the language of imagery as well as the language expressing emotion, and using the beautiful language by playing with the sounds in words. As a result, Khlong Phab Rueng Ramakien is suitable to convey the story in the pictures in which it enables readers to better understand the pictures, helps arousing imagination to visualize the pictures and contains literary beauty. This research explores monster characters which are the representations of akusala-kamma and local and cultural identities in ‘Naen Kaew and Noi Chaiya’ cartoon book series. The results show that there are in total 11 types of monster, namely 1. ant, 2. TV monster, 3. monkey, 4. Japanese soldiers, 5. chicken, 6. sea monster, 7. pig, 8. buffalo, 9. ‘Phi-ta-khon’ ghost, 10. ‘sao khom fa’ ghost, and 11. tiger. Each of these monsters represents akusala-kamma — greed, hatred, and delusion. Greed is portrayed through pig and monkey monsters, hatred through 7 kinds of monster, and delusion (or lust) through TV and chicken monsters. Moreover, some monsters (monkey, sea, and buffalo monsters, and ‘ta-khon’ and ‘sao khom fa’ ghosts) are designed to depict local and cultural identities. All in all, with such distinct representation of akusala-kamma, Thai identities, and Dhamma, the series has been highly acclaimed and received many awards. This article aims to investigate the creation of Jataka tales in the forth book of Chokdee Tales series which portray the Dhamma about Mangala-Sutta in the Tipitaka. It has been found that there are 3 stories in the book that are based on Jataka-Atthakhata, namely Lomasakassapa the Hermit on the Verge of Losing Himself, The Change of Fortune of Black and Albino Monkeys, and Cullapanthaka and Dust Clothes. The creation of this illustrated book is distinguished by the use of various techniques to win your own theart. In addition, the stories can be easily comprehended by children because of illustrations and emotive language, and the author also provides summaries of the Dhamma for his readers. Not only has the series been widely enjoyed because of its creativity, but it has also taught the readers the Dhamma about Mangala-Sutta which inspires them to create their own luck. This paper aims at collecting and studying the meaning of places’ names around Disit Palace: streets, gates, courts and gardens. Duangtawan Street, Benjamas Street, Baiporn Street, Sii Sae Gate, Kilen Gate, Khao Mai Court, Farang Kangsai Garden, Bui Pai Garden were built by King Chulalongkorn (Rama V). This paper is the documentary research which accumulate both primary and secondary source from National Thai Archive, the collection of report about the history and architect in Dusit Palace, and the map of Bangkok around 2450 – 2453 B.E. The research found that, the names given to the places in Dusit Palace are derived from Royal China Porcelain which was interested by King Rama V under the trend of arranging the Chinese altar. Together with studied King Rama V written works and interview with the expert in China Porcelain, also found that those names reflect to Tripittaporn or the three blessing: being powerful, being wealthy, and being healthy. That is to say, blessing for his Palace and Kingdom to success in those prosperity. Nowadays, the names given by King Rama V have declined together with the downfall of the popular of arranging Chinese altar. Thus these names remain only in recorded document. 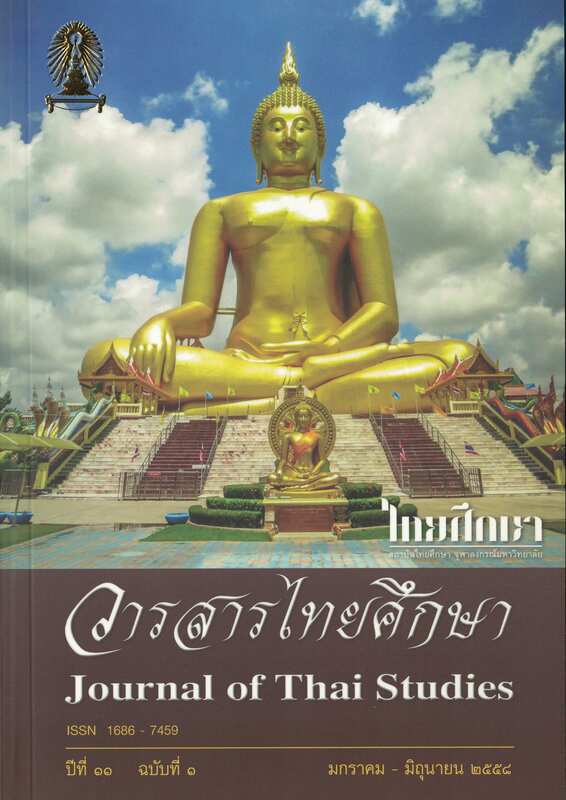 This historical and documentary research article aims to study the inheritance of the traditional musical instruments in Thai society during Rattanakosin Period. The four fundamental types of Thai musical instruments are classified into four categories consisting of plucked instruments (lute), bowed string instruments, percussion instrument, and wind instrument. As an outstanding traditional treasures, these inventive instruments, have been creation of unique integrated craft works of woodcraftsman, turner, pad fitting, moulder, lacquer work, carver or sculpture, pearl artisan, and pearl marquetry. Since Sukothai period onwards to the present reign, the craft works in traditional Thai musical instrument has encompassed significantly the cultural role in Rattanakosin Period, notably, inheritance of craftwork of the royal Court to layman craftsmanship, knowledge integration of instrumental craftsman invention, role of Thai musical instruments, context of Thai society relating to Thai instrumental craftworks. Thai inventive musical-instrumental craftworks in Rattanakosin Period which were developed during the reign of King Rama the Second onwards, has become influential dynamic in supporting and promoting social cooperation for more creativity of Thai musical instruments in order to sustain the traditional treasure of Thai society including ASEAN and global communities. The Legend of Phya Kong and Phya Phan is a local legend behind the creation of Phra Pathom Chedi. The legend says the relationships of people in the western region are formed through war and kindred families. This article aims to explore the traces of the relationships of people in the western Thailand in the various versions of Phya Kong and Phya Phan legend and to study the values of the this legend in recording history and connecting people in the western part of the country with the collective experience of having “the same legend”. The study found that the Phya Kong and Phya Phan legend derives from Sanskrit literature. In Thailand, several versions are found and can be divided into two storylines: one is a story about the killing of his father which explaines the archeological site of Phra Pathom Chedi; and the another is a story about Princess Usa and Prince Barot. The patricide storyline describes the establishment of Phra Pathom Chedi and the links to related areas, particularly in the western region, including Nakhon Pathom, Kanchanaburi, Ratchaburi and Suphan Buri. These cities are among the major cities in the Dvaravati period where people from other places were forced to settle in later. The relationships found in this legend are both negative and positive, reflecting the conflicts and subsequent compromises in the western region and are integrated with the Buddhist thoughts. The Princess Usa and Prince Barot tale discusses the relationship of the urban areas along the Mekong River and is not tied to any Buddhist concept.